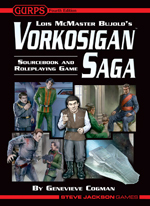 We've been working on Lois McMaster Bujold's Vorkosigan Saga Sourcebook and Roleplaying Game for a long, long time. (For those with long memories: As long as In Nomine? I'm not sure, but it may be close.) There have been delays . . . artist changes, and even an edition change, as it fell in the cusp between Third and Fourth edition rules. It's been one of Steves *personal projects,* because he loves the series so much. And now the book is entering the final hour. The light at the end of the development pipeline can be seen. The fat lady is warming up. Feel free to add whichever euphemism for "it's nearly done" you prefer. There is one more piece of art to tweak, and then Lois' final approval of page proofs -- a vital stage, I might add. No matter how impressed we are with the project, if it doesn't match the characters and worlds she envisions, it isn't done. That said, we've kept Lois in the loop throughout the development of this project, so we're confident things will go smoothly from here. Which means we anticipate having a PDF version available on e23 in early summer, and the hardcover a few months later. You can expect the usual sneak peeks to start up Real Soon Now.